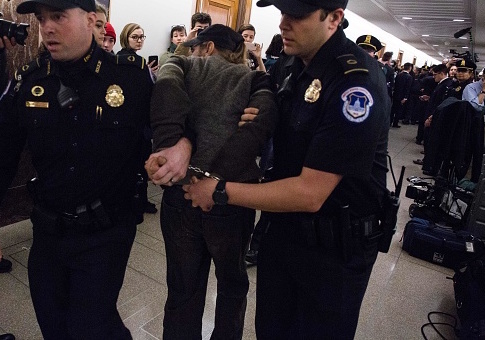 An individual who works at an organization run by David Brock, the liberal operative who founded Media Matters, was arrested after pushing a female Interior Department communications official to the ground outside of a hearing. The Daily Caller reports the incident occurred after Ryan Zinke, the Interior Secretary, testified before the House Committee on Natural Resources on the department's 2019 budget proposal. An individual who identified himself as being a reporter with American Bridge 21st Century, a progressive opposition research firm created by Brock that regularly deploys video trackers to attend events with Republican politicians and officials, approached a female senior member of the Interior Department's communications team and pushed her to the floor before chasing after Zinke. Laura Rigas, the Interior Department's communications director, told Politico that she was "greatly alarmed and extremely irate that a female senior member of my DOI Communications team was physically assaulted today by a Democrat staffer from the PAC American Bridge." The Department of the Interior filed a police report and the operative was arrested on Thursday. American Bridge is the main vehicle used by Brock, a Clinton ally, to attack Trump and Republicans. American Bridge PAC has hauled in nearly $10 million this cycle, Federal Election Commission filings show. This entry was posted in Issues and tagged David Brock. Bookmark the permalink.